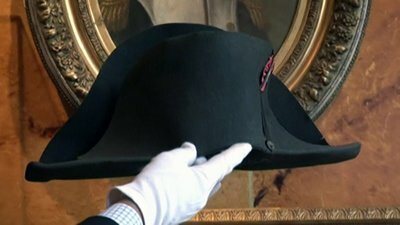 Recently one of the largest auctions of Napoleon memorabilia ever held yielded about $12.5 million, including $2.4 million for one of his signature two-cornered hats. Hundreds of people crowded at an auction house located right outside of Napoleon’s former residence to bid on an extensive collection of memorabilia that the ruling family of Monaco owned. About 1,000 items were sold during the two-day auction organized by the Osenat and Binoche et Giquello auction firms. Among the memorabilia that now appeared in the hands of private collectors and public museums are Napoleon’s handwritten letters, the emperor’s death mask, a diamond-encrusted dress sword and military medals. Also there were his cologne bottles and silk stockings, the white satin slippers worn by his son at his baptism and Josephine’s embroidered purse. But the most unusual item was the kitchen knife that belonged to the German student Friedrich Staps who plotted Napoleon’s assassination in Austria in 1809. Staps was caught and executed by a firing squad. It should be noted that today there is a great demand for things that once belonged to Napoleon. According to the data provided by the New York Times most items offered at the auction were finally sold at a price at least twice bigger than it was estimated before the biddings started. For example, a lock of Napoleon’s hair brought in nearly $50,000, and the price for his hunting rifle reached over $300,000. An 1807 portrait of Napoleon by French artist Paul Delaroche was sold for $570,000 and a huge bust of the emperor for $870,000. A pair of the emperor’s gloves was sold for $75,000—10 times more that the price estimated by the experts. But the most expensive item of the auction turned out to be one of Napoleon’s signature two-cornered hats, known as a “bicorne”. This weathered hat was said to have been worn by Napoleon during the Battle of Marengo in Italy in 1800. Even though the bicorne was a popular piece of clothing worn by many military men of that time, Napoleon was distinguished by a special manner of wearing it. This distinctive style of wearing a bicorne made him stand out and easily identified. During his military career Napoleon had about 120 bicornes, and the majority of the surviving hats are exhibited in various museum collections. The hat sold at the auction for $2.4 million to a South Korean businessman T.K. Lee was initially valued at between $375,000 and $500,000. The rare item had been presented to Napoleon’s cavalry veterinarian, Joseph Giraud, and was treasured by his family until it was sold in 1926 to Monaco’s Prince Louis II, great-grandfather of Prince Albert II, the current ruler of Monaco. Prince Louis II, a great fan of Napoleon, collected a number of Napoleon’s memorabilia, and Prince Rainier III added to the extensive collection, which was exhibited in a museum attached to the prince’s Monaco palace. The House of Grimaldi has decided to sell part of its precious collection that eventually brought in about $12.5 million to raise funds for a palace restoration. Such events demonstrate that there is a market for Napoleon memorabilia. According to the report provided by the New York Times, since 2000s the value of Napoleonic relics has increased dramatically. This can be proved by the fact that an engagement ring belonging to Josephine was sold for $1.2 million, and her marriage contract with Napoleon brought in more than $500,000 a year before. If you are interested in various sorts of memorabilia the best place to look for rare and exclusive items is eBay. At eBay you can find great items that would enrich your collection. Plus you can get an extra discount on your purchase with eBay Promo Codes.